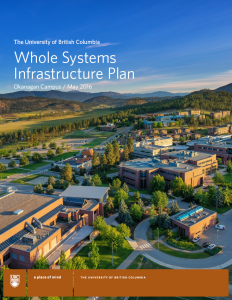 The UBC Okanagan Whole Systems Infrastructure Plan (2016) is an implementation framework of the UBC Okanagan Campus Plan (2015). Viewing the campus as an integrated set of systems, the Plan proposes actions to guide the next phase of the campus’ physical planning and design to support sustainable campus growth, community wellbeing and ecological resilience. The UBC Okanagan Whole Systems Infrastructure Plan (WSIP) was endorsed by UBC Okanagan Executive in 2016. Developed in parallel to, and in support of, the UBC Okanagan Campus Plan (2015), the WSIP is a result of a comprehensive technical planning and review process that involved a broad range of staff, technical experts and academics across UBC. The Planning process was led by a multi-disciplinary consultant team, supported by special advisors, and core project team comprised of representatives from UBCO Campus Planning and Development, UBC Campus and Community Planning and UBC Energy and Water Services. 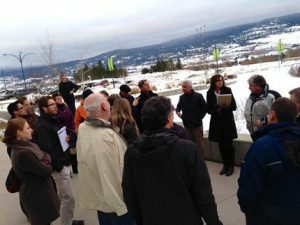 Targeted Plan consultations were undertaken with the UBC Okanagan Provost and VP, VP Research, AVP Students, Associate Dean of Engineering, DVC DRT, Deans Council, and externally FortisBC and City of Kelowna. FortisBC provided sponsorship toward this Plan’s development. The WSIP provides a long term roadmap, proposed performance metrics, and a five year implementation plan, to guide future planning, investment and management in a manner that will support sustainable development, community wellbeing and ecological resilience. For further information, please contact Leanne Bilodeau, Associate Director, Sustainability Operations. Plan Development ProcessThe emergent Whole Systems Infrastructure Plan is a technical implementation plan arising from the Campus Plan (2015). What is Whole Systems Thinking?Whole systems thinking is a method to understand how things (elements and systems) are related, and how they influence one another within a whole.